In an earlier Play the Past post, Mark Sample asked how historical alternate reality games (ARGs) can be more than facts-only reenactments while still accurately teaching the past. The intertwining of “true” history and manufactured, but historically grounded game mythology forms a fertile base for counterfactual methods of historical learning. In The Arcane Gallery of Gadgetry (AGOG) ARG, whenever information in the factual record was missing or suspicious (e.g. numerous real but unexplained fires in the U.S. Patent Office, historical rivalries between inventors), students were encouraged to play with the available knowledge and consider reasonable extrapolations. AGOG started from the premise, backed by a considerable body of existing neuroscience research, that counterfactuals are a powerful learning tool. In an interview on her ARG mythology design process, AGOG writer Ann Fraistat argued that passivity toward historical lessons is a fault of their format: “We really do take history for granted. We can’t help it; the narrative format makes it feel inevitable. ARGs are an exciting way to open up possibilities when studying history.” Other Play the Past posts have discussed the merits of counterfactuals when teaching history (here and here), but I’d like to use this post to discuss some ethical issues that arise when one introduces counterfactual history–coupled with the ARG standard of TINAG (This Is Not a Game)–into a traditional classroom environment. Game facilitators recorded students’ questions and ideas during a brainstorming session within the ARG. Counterfactual thinking can be a revolutionary learning method for students whose interactions with history are more likely to involve memorization than questioning. In more conservative educational environments, though, the simultaneous introduction of counterfactual methods and the looser ARG format can disrupt the traditional practice of trustworthy-teacher-to-student content delivery in potentially negative (or at least unanticipated) ways. 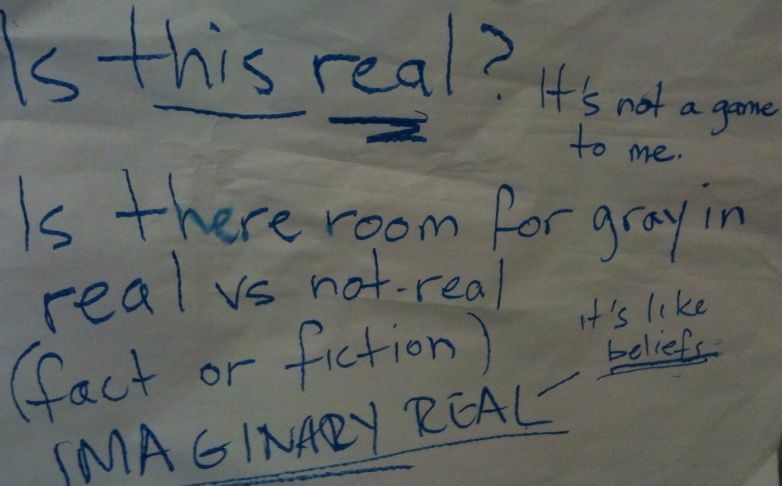 With an educational ARG that incorporates counterfactuals, students are not only coming to terms with a new way of thinking about the past; they’re also struggling with defining how much of the epic circumstances they’ve come to be involved with are “real.” Are they playing a game? If so, how much of what they are learning about the past is “real,” and how much is game artifice? AGOG was part of a study of how students responded to ARGs in an educational setting, so it was important for our game masters not to break TINAG unless participant safety or peace of mind was at stake. In an educational ARG run outside of a research study, however, how would teachers respond to student questions about the reality of their activities? If a teacher maintained the fiction, he’d preserve the excitement and drama of the game and possibly render the learning outcome more profound… but would he also fail at his more pressing imperative to be a trustworthy resource for his students? How can we play the past in a way that successfully teaches real facts and counterfactual thinking without causing students to despair of knowing what to trust and what to question? Players tune in to a video post by AGOG character, April G.
Even over the relatively short lifespan of alternate reality games, a considerable number of ethical dilemmas have arisen as a result of TINAG design philosophy. Andrea Phillips’ SXSW 2011 talk on transmedia ethics covered how these issues have manifested in the more popular ARGs (Minchew). Even the wildly successful games she discussed carried risks in what they taught. Philips cited a group of players from The Beast (the ARG associated with the movie A.I.) who felt so empowered by the skills they’d gained that they had to be dissuaded from tackling a far riskier challenge: tracking down the perpetrators of 9/11. When ARGs are deployed within a classroom, their creators have an even greater responsibility toward the safety and consent of their players (if that’s possible). Students might have a short attention span and easily forget or set aside caveats and warnings; our players, for example, never cited our initial statement that we would be playing a game when later questioning the reality of the ARG narrative. Younger students are all too often encouraged to quickly follow directions issued by adults, rather than independently evaluate information for credibility. Gauging the trustworthiness of online resources is a skill that young students might also lack; how, then, to teach students methods for questioning the reliability of information when a game also delivers fictional content through a professional-looking website? One solution is through the visual design of the game: creating markers (but not pointers) to the surmised and fictional. An example of fiction on the player community wiki. In her transmedia ethics talk, Andrea Phillips suggested tagging web pages with a “fiction” favicon. As we designed AGOG, we discussed various similar options for labeling fictional material. Color-coding could distract readers as well as point too directly at the constructed, highlighting such elements as purely inventive rather than as non-factual but still plausible. Outright labeling of information as either “officially known” or “guessed” again presents problems: What makes knowledge official or set in stone? Aren’t we trying to teach history beyond the canonical and institutionalized content that is “written by the victor”? Some of the historical information on our player community site was purely fact, and these elements were hyperlinked to credible web sources corroborating what we described; other game elements were clearly fake (e.g. an antebellum invention that allowed players to telegraph the past). The majority of historical fact-falsehood overlap appeared on the AGOG player community wiki, which was initially populated by content created by the puppet masters, but received player additions as they uncovered knowledge throughout the game. When a player reads on the wiki about a real historical event for which we’ve invented fictional causes–or about a real historical personage with a fictional secret identity–this information is divided into two sections of the page: what we know about the “public” (i.e. true) and “private” (i.e. fictional) aspects of these entities. This layout separates historical fact from the game’s imaginings, marking the reliable as different from the questionable; at the same time, this marker does not pull the player wholly out of the game world by heavy handedly pointing directly at the false. Another option we considered but did not implement was crafting the game’s main character April as not only the ARG’s narrative focus, but also as someone who could be trusted to know and identify the real from the dubious. April interacted with the players in real-time; that mechanic, in combination with her being closer in age to the players than the game makers were, resulted in the players showing a high degree of trust and identification with April. Such a trustworthy character could also use markers instead of pointers to preserve TINAG, perhaps by pointing players to actual resources for the historical facts they question while using a code phrase such as “Someone told me they saw it on the Internet” (something students should learn to distrust anyway!) for fictional elements. How would you deal with the ethics of counterfactual ARGs in the classroom? How important is the TINAG experience to younger game players’ learning? We’ll be running a second season of AGOG next year aimed at an older audience and would be happy to hear your suggestions or experiences. Minchew, Brandie. “SXSW 2011: Andrea Phillips on Blurring the Lines”. ARGnet, 24 March 2011. Player status updates are from The Arcane Gallery of Gadgetry’s JuntoLives.org player community (a locked site) and are used with permission; their spelling has been gently corrected. The Arcane Gallery of Gadgetry and the research study surrounding it are generously supported by the National Science Foundation through an EAGER Grant. Drs. Kari Kraus and Derek Hansen are PIs on the study, Elizabeth Bonsignore and Amanda Visconti are graduate student investigators, and Ann Fraistat is the ARG’s creative writer. Visit ArcaneGalleryOfGadgetry.org to find about more about the research study, read about Season 1 of the ARG, or sign up to hear from us when we begin Season 2. I dealt with this issue when developing GISKIN ANOMALY, a cellphone adventure that’s running in Balboa Park, San Diego, in 2011 (giskin.org). That game has a historical component: through a wondrous device (the Giskin Anomaly Detector) players listen to thoughts left by people in the Park caught up in the events of World War Two. For GISKIN I built upon the groundwork laid by historical fiction in books and movies. The arc of the story is of people caught up in events; the characters are common people (not in positions of power); their last names are never mentioned – three examples of readily understood cues that the characters are fictitious but the history intends to be real. I think it’s wise for games to use the vocabularies of presentation that have already been established in other media, but I do realize that their interactive nature presents additional challenges. The TINAG (This Is Not A Game) component of ARGs should not be one of them. A TINAG problem such as the one mentioned for AGOG is a sign that the game designers took TINAG to be a rule rather than what it actually is: a narrative device. Narrative devices have storytelling goals, and the author’s challenge has always been to go far enough with the device so that the story is authentic yet not so far that the device actually undermines the storytelling. In games, there is an added dimension to this challenge, in that games are constantly negotiating storytelling power between the gamemaster and the player, and the narrative device affects this. If I had a player in one of my games say “You don’t make it clear what is fact and what is fiction,” the main message to me is that my game setting has failed to give her the proper sense of agency: she and the other players should be sorting out for themselves historical fact from historical fiction (and having fun doing so).